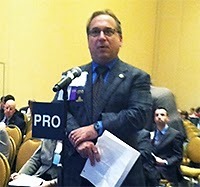 Child psychiatrist and member of the AMA Council on Science and Public Health (CSPH) Louis Kraus, M.D., testified yesterday at the Interim Meeting of the AMA House of Delegates in support of a CSPH report on individual, societal, and public-health issues concerning federal drug control policies, the so-called “war on drugs,” state-based cannabis activities, drug decriminalization/legalization, and the intersection of illicit and prescription drug abuse. The report would put AMA on record as supporting the modification of state and federal laws to emphasize public-health strategies to address and reduce cannabis use. Kraus is chief of child and adolescent psychiatry at Rush University Medical Center. Specifically, the report urges development of a comprehensive national policy acknowledging that federal efforts to address illicit drug use via supply reduction and law enforcement have been ineffective and should be accompanied by increased efforts to reduce demand for illicit drugs. Kraus emphasized that the report does not support legalization or reclassification of cannabis and does not address potential medicinal effects of cannabis, for which he said insufficient evidence exists. The report will be voted on by the full House of Delegates today. To read more about research on cannabis use, see the Psychiatric News articles, "Cannabis Users Have Earlier Age of Psychosis Onset" and "Medication Coupled With Rewards Found to Reduce Cannabis Use."